Have you heard back yet from that college or scholarship you applied to? What you should be doing NOW to stay on top of financial aid and college applications. In February, excitement of graduation begins to fill the minds of many students. However, don’t let “senioritis” leach your motivation and take your eyes off your goal! There are still things you can be doing right now to stay on top of the financial aid and college application process. If you aren’t even thinking about how you will pay for college, zip on over to our previous post about how to avoid the financial stress college can bring. By now you should be beginning to hear back from colleges you have applied to, as well as different scholarships you have completed. However, don’t end your search for scholarships here! There are still many scholarships out there for grabs. Check out this link for some scholarship deadlines that you can still meet and this link for scholarship search tips and tricks. If you have heard back from a college that you want to attend, check to see if you have a scholarship offer. You can typically see this when you sign in your college account. If not, pick up the phone and call the school’s financial aid office. This call will be well worth it because you want to make sure that you are getting all of the financial aid that is available to you. You can even go in-person to the financial aid office to talk to the appropriate adviser if the school is not far from you. 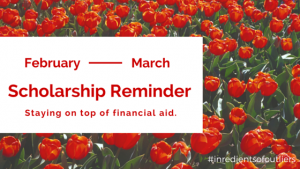 Remember, you can get a scholarship amount that is more than your tuition. Some students worked so hard on their scholarship search that they are receiving $50,000 in scholarships a year when their tuition is only $20,000! They are able to pay for living expenses, books, and forego part-time employment so they have more time to study. Now the scholarship application process can be like working a part-time or full-time job when applying for various opportunities, so don’t get discouraged if it’s time consuming. However, your time spent applying before school starts will pay off with less stress during the semester. If you are still unsure of which colleges to apply to and are open to various locations, check out these colleges that offer full-ride scholarships for those who qualify! How Is Your Scholarship Hunt Going? We would love to hear from you! What have you found to be the most useful piece of information that has helped you with your scholarship search? Did you get a scholarship? Comment below with your financial aid progress. Lastly, do you have a friend who is stressed about how they will pay for school? Share this post with them.